Latitude 39 Indianapolis is a 60,000 square feet luxury entertainment complex which includes restaurants, bars, luxury bowling, cinema and nightclub. For this project, CCL was commissioned to design and supply a 60,000-square-foot (60,000 m²) slab on grade. The original design was for an 8" (203 mm) traditional reinforced concrete slab on grade, on a base soil mixture of bad fill and debris. The geotechnical report required a light slab with engineered fill. CCL provided an economical design: a 5" (127 mm) post-tensioned slab to replace the 8" slab, reducing the engineered fill needed. Problematic soils can expand when wet, driving upward pressure to the base of a slab, and contract when dry, potentially giving way under a slab. 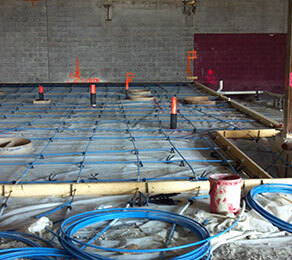 Thanks to the flexural and tensile capabilities of post-tensioned slab on grade over traditional reinforced concrete, CCL greatly reduced the amount of engineered fill required to combat the poor base soil, thus reducing cost. Time was saved by using post-tensioned slabs; they can be constructed much faster because they do not have the thickness of traditional reinforced concrete slabs, and because the slabs are thinner, pour areas can be greater, resulting in less excavation and less concrete, allowing quicker redeployment on formwork. Larger post-tensioned slabs can be designed to have fewer or no expansion joints - a long term cost benefit - as this significantly reduces the need for future joint maintenance.